Some areas may require a travel charge depending on time and distance traveled. Our normal delivery areas include Columbia, as well as Lexington and Richland County. If our schedule permits, we may travel up to one hour from West Columbia. Please call to inquire regarding availability outside our normal delivery area. Delivery usually within 24 hours, and can be done the same day in most cases. We have delivered as far as Newberry, Camden, Sumter, Orangeburg, and Augusta. Having a baby is one of the most miraculous events life has to offer and baby’s first day home is a very special day in the lives of new parents. We are pleased to help you announce your exciting news in the best possible way. 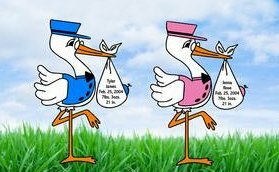 Thank you for choosing Stork News®!